The Former Mt. 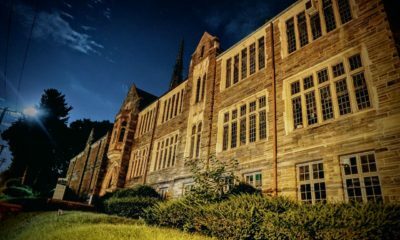 Airy Historic Church is Being Converted into a Haunted Circus Mansion! Celebrate your freedom to fly! Philadelphia School of Circus Arts announces the grand opening of Philadelphia Flying Trapeze. Philadelphia’s only permanent outdoor flying trapeze school will offer two-hour outdoor flying trapeze lessons at Circus Campus, 6452 Greene Street in West Mt. Airy – conveniently directly next to the Upsal SEPTA Station. The first lessons take flight this weekend as a preview, with the official grand opening set for Thursday, August 16, 2018 at 10:30am. Lessons will run Wednesdays through Sundays, through October 28, 2018, with weekday lessons running 11:00am to 1:00pm and 6:00pm to 8:00pm, and Saturdays and Sundays at 10:00am to 12:00pm, 1:00pm to 3:00pm and 4:00pm to 6:00pm. Lessons are $63 each or class cards are also available. Flyers must be six years and older. For more information and to book, visit: http://philadelphiaflyingtrapeze.com. Philadelphia is ready for another circus first! Philadelphia and circus have a very special history. The city of Brotherly Love was the birthplace of American circus. Philadelphia for many years was also home to one of the country’s only recreational schools of circus arts. 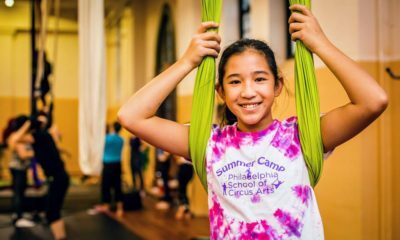 Philadelphia is currently home to the first and only school in the country that offers a three-year education program and diploma in circus arts through Circadium School of Contemporary Circus. Now, circus history goes sky high as the city’s only permanent outdoor flying trapeze school makes its grand debut. Set next to the historic former St. Madeleine Sophie Church, students will ascend the outdoor rig in the beautiful setting that features mature lush trees, expansive lawns and historic architecture. Philadelphia Flying Trapeze is one of the only schools in the country that is set in an urban setting with such a magnificent view. SEPTA riders already are getting an unexpected birds eye view of the action as trains are arriving just feet from the trapeze rig at the Upsal station. Adults and children (ages 6 and up) are invited to celebrate the empowerment, confidence and freedom found in doing the unexpected. Students will soar to new heights during two-hour high-flying class. 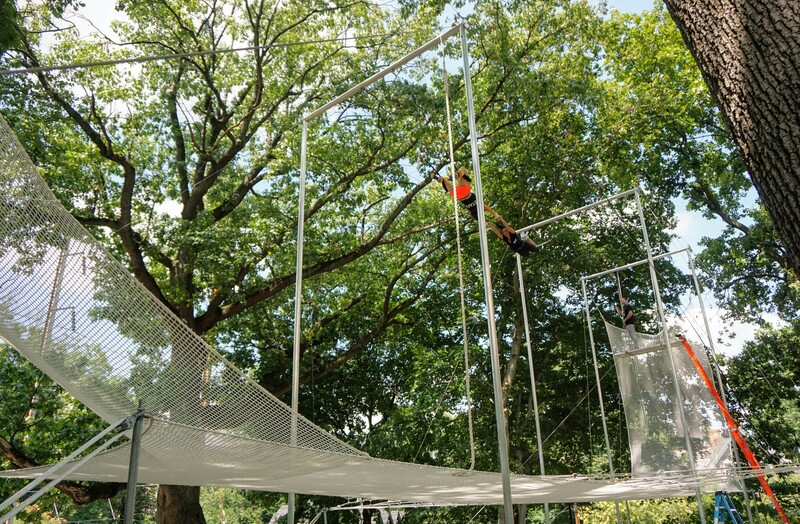 Students of various ages and abilities will learn the art of flying trapeze on a full-scale outdoor flying rig on Philadelphia’s Circus Campus. Learn all the techniques of the art form – including taking off from the platform, the swing, the transfer to the catcher and the dropping to the net. Classes are open to students six years and older. Flyers must be at least six years old. The weight limit is 250 lbs. All participants will be harnessed in the air. Some weather conditions may apply – please see any weather announcements day of class. Philadelphia Flying Trapeze will run under direction of Philadelphia Flying Trapeze Program Director Mary Kelly Rayel. Mary Kelly Rayel graduated from Ithaca College with a B.A. in Theater. Having been fascinated with Ringling Bros. Barnum and Bailey Clown College as a youth, she decided to apply. She was one of 8 women and 31 men to be accepted that year for the class of 1990. This experience was life changing, starting a lifelong career with Circus arts. For the last 20 years, she has been performing and instructing Circus skills and aerial acrobatics. Philadelphia Flying Trapeze lessons are $63 for a single class, or class cards are available for three classes for $165 and six classes for $315. Private individual and family lessons are also available. Flying trapeze classes are also available for birthday parties, bachlorette/bachelor parties, corporate team building and for other groups. 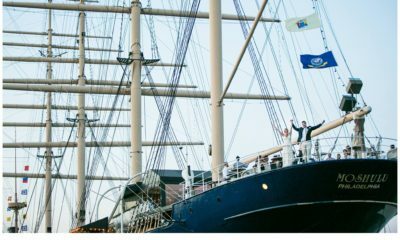 Philadelphia Flying Trapeze will run every Wednesday-Sunday, through Sunday, October 28, 2018. Class times vary per day: Wednesdays, Thursdays and Fridays at 11:00am to 1:00pm and 6:00pm to 8:00pm, and Saturdays and Sundays, 10:00am to 12:00pm, 1:00pm to 3:00pm and 4:00pm to 6:00pm. Other times for private and group lessons are also available upon special request. Philadelphia School of Circus Arts – recreational training for adults and kids in lots of disciplines. Philadelphia Flying Trapeze – flying trapeze!